As an artist and biomedical laboratory scientist born and living in the circumpolar area of the earth there are a particular natural phenomenon found both in the northern and southern hemisphere, we on occation during the dark season of the year can see at the sky. It is the northern light also known with the Latin name, Aurora Borealis. The northern light, is one of several astronomical phenomena and can be seen as waves of coloured light visible at the sky. This phenomena has since prehistoric time fascinated humans. It has been connected with myths, forklore, influenced the course of history, religion and art has been scientificly investigated for many decades. The northern lights occur in the Earth’s ionosphere, and results from collisions between energetic electrons,atoms and molecules in the upper atmosphere. The ultimate origin of the energy which powers the aurora borealis is the Sun – via the solar wind – and the Earth’s magnetic field. The fact that the northern light during wintertime is highly, visible over the roof of my family’s house indicates that there is a strong electromagnetic field in the earth under the house. This forms the starting point for this art project. First the intuitive journey was invented by the idea that the electromagnetic field under my family’s house could go either north or south after the true magnetic north pole. I chose to go both ways. By using these quotes can I see that this argument can be interpreted as an easy way to avoid the discussion, on the topic a more sustainable world. I will discuss this in later in the essay. The fourth principle is to use film as artistic medium for the intuitive journey. To make film and develop a film for an exhibition is a totally new experience for me. The invented journey had a starting point, which could be seen as a catalyst for the art project. I was invited to be an observer at an oil spill rehearsal near Tromsø, the following day the Barents rescue 2013 took place in Lyngen in Troms. 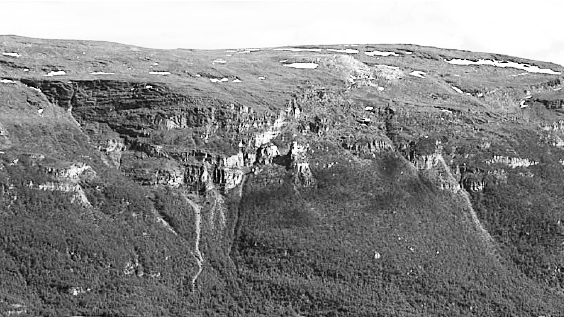 Nordnesfjellet with its large destructive rockslide, formed the backdrop for the scenario of the rescue operation. Instead of being an accredited observer for the rescue operation, I by coincidence met one of the local inhabitants affected by the rehearsal. He could tell a different story about how the destructive rockslide scenario of the rescue operation affected the local community. 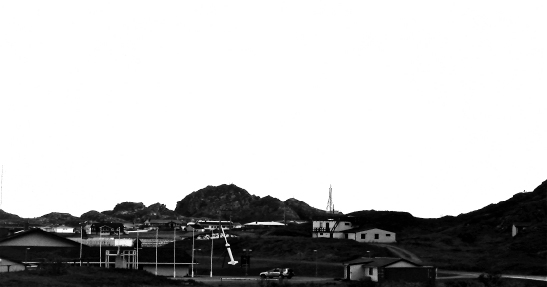 The island I visited is, Andøy. Andøy lies at a latitude of almost 70ºN, and is further north than either Kautokeino in Finnmark or Murmansk on the Kola peninsula. Iceland is in the closest country in the west. Thanks to the Gulf Stream the climate is relatively mild. Andøy has the midnight sun from 19 May until 25 July. Andøy has been described as a “geology textbook”, with the youngest and oldest type of rock in Norway. Three of the marshy areas of the island are nature reserves. The island has 231 kilometres of shoreline. There is definitive evidence of settlement from 1400 BC. At Andøy there are remains of two Iron Age farms and one mediaeval farm. Truly inspirational, especially because of the excellent guide was my visit to Tromsø Telemuseum. The museum could support me with information about the history of Norwegian tele communication. Can the fact that I am working intuitively be of any relevance for this art-project? 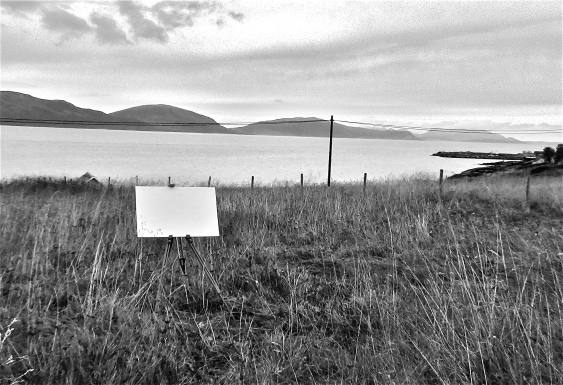 After 25 years as a biomedical laboratory scientist at the university hospital of Northern Norway, I decided it was time to quit and start a new path, which included an education as an artist. Today I have been working as an artist for almost seven years. Two opposite directions could one remark. Not to me, because the department I left was the In Vitro Fertilisation Unit. I worked there for almost seven years, At an IVF unit you are responsible for human embryos and the conditions for their development. In a team of doctors and midwifes, the biomedical laboratory scientist is responsible for choosing the embryos, who could give the most successful outcome for the couple. I would say this was based on a visible and intuitive process. The longer I worked there; the ethical aspects of this treatment became more and more obvious. In Norway, the regulations for biotechnology are very strict compared with other countries, but trade with human embryos,intracytoplasmic sperm injection, pre-implantation genetic diagnosis, which in Norway is used for embryos with diseases, in India and in the islamic world a tool for selecting gender of the child are today part of this business. A biomedical scientist said: ”We are as scientists prepared to make human clones, if this will benefit our carrer.” The feeling of working with vulnerable and to me very valuable biological material became more and more ethical difficult. 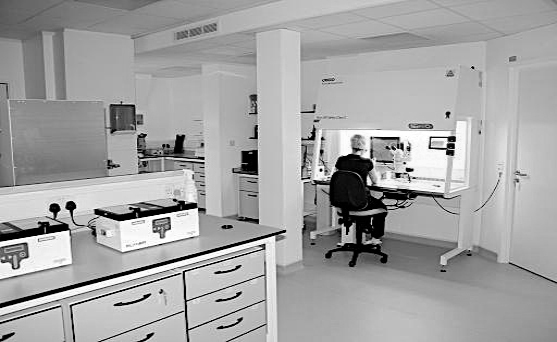 I have never regretted my decision to leave my previous position as a biomedical laboratory scientist; all my previous experience has been valuable for my artistic development. For some artists intuition can be the main source for inspiration, to me is it essential. There are may synonyms for the word intuition, some of the synonyms for intuition are: instinct, second sight, sixth sense and innate knowledge. Innate knowledge can mean to talk to your personal unconscious mind, to me is the main aim is to be able to develop a talk to my collective unconscious mind. This is a Jungian concept and can be described like this. My working method as an artist can be described like this; By first choosing artistic material and how to work with the material, the process starts with a kind of a inner dialog, where I let my intuition decide. Symbols, dreams and factors in my surroundings can be involved. The first outcome can be quite surprising and challenging. Only by continuing being in the process and add new elements will there be, to me, an outcome which can be visible and satisfying. This process of working can for an outside viewer be interpreted as complex and difficult to understand because it has a beginning, no end and is not easy to explain during the process. I like this feeling of motion. I want my art projects to be like this, mostly because it relate to the history of my upbringing as one who lives in the circumpolar area of the north. “The cloud can not be painted, it does not fit into the theory of perspectives in a painting, and it becomes abstract. Synnøve Persen paints the cloud.” By learning about this, the fishnet, to me, becomes the cloud that can not be painted. At the same time can it represent a structure of the capitalistic and global systems, which have collapsed. The juxtaposition of the painting and the fishnet can represent the structures of power and nature. Now, I think it expresses, my quiet grief for a sustainable culture that is slowly dying because of our capitalistic demand for new areas of the earth to exploit. Today we find our region being explored with an enormous interest for our nature resources. Oil drilling in the Barents Sea is a factum, the sea area outside Lofoten, Vesterålen and Senja are still not investigated in regards of oil, but it is as if we know that our most vonuralable area for hatching fish contains enourmous oil resources. The multinational mining industry is also present in our region. We are at the beginning of a new area for the circumpolar north, the government tells us that the region needs to be developed, we need to establish new industries, and so on. Why is it so difficult to crate solid arguments for a sustainable future? I will now continue with the theory of echosophy, originally invented by the professor at University of Oslo in 1972, Arne Næss, He introduced the terms ” deep ecology movement” and “ecosophy” into environmental literature. Næss based his article on a talk he gave in Bucharest in 1972 at the Third World Future Research Conference. In his talk Arne Næss discussed the longer-range background of the ecology movement and its connection with respect for Nature and the inherent worth of other beings. Næss introduced the term ecological wisdom, synonymous with ecosophy, in 1972. “By an ecosophy I mean a philosophy of ecological harmony or equilibrium. A philosophy as a kind of sofia (or) wisdom, is openly normative, it contains, norms, rules, postulates, value priority announcements and hypotheses concerning the state of affairs in our universe. Wisdom is policy wisdom, prescription, not only scientific description and prediction. The details of an ecosophy will show many variations due to significant differences concerning not only the ‘facts’ of pollution, resources, population, etc. but also value priorities. The concept has become one of the foundations of the ecology movement. It is also often associated with indigenous peoples cultural practices. When Arne Næss talks about “Sofia or wisdom, he may talk about the innate wisdom or intuition we have as humans, this wisdom can be related to Jung’s understanding of the collective unconscious. “Today we have come to realize that we live in a complex and uncertain world, where the actions we take for one particular issue, at a particular scale, have implications for other issues at other scales. For instance, while petroleum activity at the regional scale helps respond to energy demands and increase short-term prosperity, it will also impact on the climate system at the global level. How, then, in this complex, uncertain and entangled world, can we ensure that we make ‘good’ decisions? Traditionally, we have mainly supported our decisions with science. However, the complex issues of our time are forcing us to rethink what a ‘good’ decision actually is. Can and should scientific models and probabilities alone support our decisions? Should we involve in parallel other sources of knowledge, experiences and values in our choices for the future? Was it invented because I wanted to investigate and revisit the places? Is it about evidence? What did I find? Is it about nature and how to protect nature? Is it about how we are scientifically investigating nature? Is it about tourism? 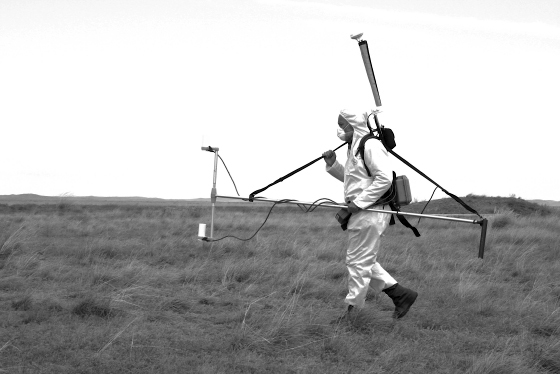 Or is it about a system, which at the same time investigates nature at the same time use it for commercial interests? For this essay have I made a selection of information I found and acquired during the journey. The information can or can not be relevant to the topic I went out to explore. The journey will be described in chronologic order. In nature, radiation is the emission of energy that takes the form of waves or particles. Two types of radiation exist, particle radiation and electromagnetic radiation. Generally, particle radiation is the release of fast-moving particles, while electromagnetic radiation consists of energy waves having both electric and magnetic properties. Alpha and Beta rays are examples of particle radiation, while the radio transmission we are familiar with is an example of electromagnetic radiation. Depending on the frequency and energy levels, radiation is either ionizing or non-ionizing. High-energy radiation ionizes atoms by forcing an electron from its orbit. Non-ionizing radiation lacks the energy to ionize atoms. As might then be expected of the two, ionizing radiation is far more dangerous. Ionizing radiation can damage biological tissue. The Earth’s magnetic field forms the magnetosphere, which shields the planet protecting it from lethal cosmic radiation and from solar storms. Solar storms are “winds” of charged particles and radiation flowing from the Sun, often as the result of violent solar eruptions of hot gas known as coronal mass ejections. Even with the protection of Earth’s magnetic field, the strongest of solar storms can disrupt electric power grids and disturb or even damage satellite-based communications and navigation systems. During the 150 years that humans have been measuring the Earth’s magnetic field, its strength has dropped 10 percent and continues to decline. This drop in strength contracts the Earth’s magnetosphere. Of even greater concern is the possibility that the Earth is heading toward a reversal of its magnetic poles, something that research suggests has happened hundreds times in our planet’s history. Scientists think a field reversal could result in a period, perhaps lasting many years, during which the protective magnetic field is greatly diminished. Earth’s magnetic field or geomagnetic field is the magnetic field that extends from the Earth’s interior to where it meets the solar wind, a stream of charged particles emanating from the Sun. Its magnitude at the Earth’s surface ranges from 25 to 65 µT (0.25 to 0.65 G). A definition of true North? It is the field of a magnetic dipole tilted at an angle of 10 degrees with respect to the rotational axis—as if there were a bar magnet placed at that angle at the center of the Earth. However, unlike the field of a bar magnet, Earth’s field changes over time because it is generated by the motion of molten iron alloys in the Earth’s outer core. The North Magnetic Pole wanders, but does slowly enough that an ordinary compass remains useful for navigation. However, at random intervals, which average about several hundred thousand years, the Earth’s field reverses, which causes the north and South Magnetic Poles to change places with each other. These reversals of the geomagnetic poles leave a record in rocks that allow paleomagnetists to calculate past motions of continents and ocean floors as a result of plate tectonics. The region above the ionosphere is called the magnetosphere, and extends several tens of thousands of kilometers into space. This region protects the Earth from cosmic rays that would otherwise strip away the upper atmosphere, including the ozone layer that protects the earth from harmful ultraviolet radiation. I was invited to be an observer at an oil spill rehearsal. The operation was a part of the Norwegian Coastal Administration’s Department for Emergency Response Unit’s training program. ”Anyone engaged in activities which may result in acute pollution shall provide the necessary emergency response system to prevent, detect, stop, remove and limit the impact of the pollution. The emergency response system shall be in reasonable proportion to the probability of acute pollution and the extent of the damage and environmental impact that may arise. The special equipped vessel and the pollution response personnel are mobilized immediately to respond when major incidents of acute pollution are reported to the Norwegian Coastal Administration.In the event of oil spills, the mobilization is carried out in cooperation with the affected regional/municipal authority or polluter according to the Coastal Administration’s contingency plan against acute pollution. In response to chemical pollution incidents, other resources may also be involved. To me this was my first experience with an operation like this, the personel was friendly and accepted me as an observer immediately. The most interesting to watch was how the crew coordinated the operation with the other vessels participating in the operation. For the operation many different vessels and ships participated, but the most impressing was the crew on the fishing boats and the diving ship, they represented the old fishing tradition in the north, and have long experience in handling the equipment for the fish industry. Kirkenes Declaration establishing the Barents Euro-Arctic Council (BEAC) at a Foreign Minister’s Conference in Kirkenes, Norway. The Barents Euro-Arctic Region Councils means is to strengthen preparedness cooperation in the north; the countries have established a common exercise platform, Barents Rescue. The goal of the exercises is to streamline communication, coordination and cooperation between the participating countries and between civilian and military units that may become involved in rescue operations in the region. This year the backdrop for the operation was the previous mentioned large destructive rockslide at Nordnes Mountain, which formed the backdrop for the scenario of the rescue operation; Rescue teams from Sweden, Finland, Russia and Norway participated in the operation. shown that the movements amount is approximately four to five centimetres annually. Cracks have been found that clearly indicate that there has been movement during the past few years. A rockslide from Nordnes Mountain is likely to be the most dramatic, as it would affect most low-lying areas in the municipalities of Storfjord, Lyngen, Kåfjord and Nordreisa. The meeting resulted in the project Fjellskred in Troms county. The project is a collaboration between the municipalities of Lyngen, Storfjord, Kåfjord, Tromsø. Lyngen has directorship of the programme. In 2009 the project received NOK 13.75 million for construction of the world’s most advanced ground-based global positioning system. A total of 18 Global Positioning Systems have been installed on Nordnes Mountain where they can register tiny movements in the rock, down to a few millimetres. Because of the need for ground drilling, the Norwegian Water Resources and Energy Directorate granted the project NOK 22 million in 2011. The funds are to be spent over a period of two years. “The only result of the rescue operation is that, the inhabitants of this area, becomes even more terrified of living here. It stops all future development, when we are talking about young people coming back to establish new businesses, it has only negative consequences for us as a small community” It can be added to the history that the knowledge about destructive rockslide has been known for at least hundred years. This was a totally opposite interpretation than the one I expected; I thought the rescue operation would make the inhabitants feel more secure and prepared for the coming catastrophe. Later that day, I filmed a military plane and three helicopters over the area. Importance for the earth. The world’s last large stock of cod spawns here, there are coral reefs on the seabed with hatching areas fish and Europe’s most populous nesting sites for seabirds are found in Lofoten, Vesteråålen and Senja. I think we can not gamble with such valuable natural phenomena as these. Well-established industries have been the basis for settlement and employment in Lofoten, Vesterålen and Senja. Drilling for oil would put these activities at risk. The oil industry cannot coexist with two of the region’s basic industries: tourism and fishing. The conflict arising from seismic exploration on the fishing grounds provided a clear warning: coexistence was not possible. The continental shelf off Lofoten, Vesterålen and Senja is too narrow to allow both oil-related activity and commercial fishing. On a trip with Andøy Whale safari one is guarantied to see a whale, we saw tree whales on this trip. The whales were found by using sonar. A sonar,is a system used for transmitting and reflecting underwater sound waves to detect and locate submerged objects or measure the distance to the floor of the sea. This is similar to the system whales and other specimen in the sea, use when they migrate, detect food and other members of the flock. The exeption is that the whale has this system as a internal part of their body. 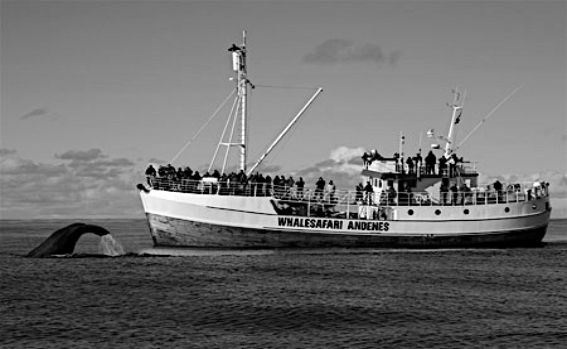 To me the sound became the essence of the journey because it was as if I could also imagine how the sound of the sonar affected the whale, when we – the tourists- was filming the wheale when it was up on the surface of the sea to breathe. Andøy Rocket Range supports sounding rocket and balloon operations both at the island and at Svalbard, and is host to a large array of ground based scientific instruments. Andøy Rocket Range also owns and operates the ALOMAR lidar observatory located at the top of the mountain Ramnan– 380 meter above sea level. The range clients include ESA, NASA, JAXA as well as national and international universities and institutes. The range employs electronic, explosive, and safety experts among other specialists and an administration. The military test center at Andøya Rocket Range offer a virtually unlimited test area for testing of aerospace and / or ship-based applications. They have the ability to conduct a wide range of operations, both civilian and classified military. The ranges test center is a limited company owned 90% by the Department of Trade and Industry, and 10% by Kongsberg Defence Systems. Commercial air traffic in the corresponding air space is low. Since most of test ranges are over sea, supersonic and hypersonic flights are possible. This information is copied from the web pages of Andøy Rocket Range, this means that the sea area outside Andøya is a test area for the weapon industry. How this affects the whales and the fish in the sea is not possible to understand, but in my opinion is the ultimate evidence on how, science speak to nature-science speak to power. I have included this information from Bellona about the enormous amount of nuclear waste because I think we are facing even more dangerous threats to our environment in the north. On the beaches of the Barents Sea, near the Russian city of Murmansk, ex-Soviet nuclear submarines lie rotting, like ticking ecological time bombs. The sinking of nuclear material and scuttling of ships used to be widespread practice. 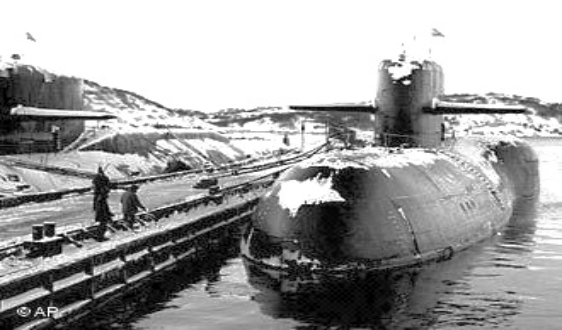 Of particular worry now is the Soviet nuclear submarine, K-27, scuttled in 1981 in the Kara Sea. The boat, equipped with two nuclear reactors, was filled with bitumen and concrete before being sunk, according to the Russian Nuclear Safety Institute, to ensure that it would lie safely on the ocean floor for 50 years. “Before that, no-one knew about the danger,” Igor Kudrik, a nuclear safety expert at Bellona said. The location for the film is a few miles outside Tromsø, this location has for centuries been a traditional North Norwegian farm with a small-scale fish production. The film depicts an old tradition in the history of art, the plain-air painting. Historically the plein-air painter was occupied with light and landscape. I paint a yellow abstract painting. I am out in nature, not depicting the landscape. The power cables and the fence are there, I can see them, but choose not take any notice of the. Maybe they can represent the grid. The grid, can represent art and the terms of art-history that I can not relate to. Art and art- history is a relatively new concept in the north of Norway. Most of our art history is based on culture history. Our culture history, have been and are still told by people coming from other cultures. We like to think or pretend that we are urban, multicultural, well informed and educated. I think, we still, in the north are in a culture with people who are being investigated, explored, told to be more international or adapt to a culture we do not believe in. In this film the painting action can be seen as a comment to me as an artist, at some level it is ironic, since I have the knowledge about what really happens in the north, but I do not take part in actions, engage in political debates, nor participate in the debates about a more eco-friendly earth. To make a conclusion about the intuitive journey is not my main aim, the aim was to experience the places from a different perspective. The principle of synchronicity is present, the same is intuition, because I chose to go to places I was familiar with, but wanted to experience from a different point of view. I participated in actions, which was completely new for me. I met people and saw how dedicated and well educated they were for their positions as helpers in rescue operations. I experienced Andøya, and met some of the islands friendly and helpful inhabitants. Lived in the same house as Chinese tourists looking for the Northern Light. I still like the feeling of this kind of nomadic travelling. I like to be in the process of not knowing were the journey will end. The complex structures of the relationship between science, power and humans is interesting and the topic will be investigated further in future art projects. My family, Inghild Karlsen, Aslaug Juliussen, Hanna Horsberg, Veronica Wiman, Nicolas Siepen, Marcus Degerman and my fellow students. Two stories connected to a piece of a wool blanket. When I was a small girl, could I, sometimes during wintertime, have a flu, an ear infection or was just feeling cold after playing in the snow. Then, a piece of a blanket, like this wool piece, was by my mother, placed on the hot radiator or close to the fireplace,to be heated. When heated, my mother, added to the wool piece one or two drops of white camphor oil. I still remember the smell of white camphor oil. The origin of the white camphor oil is the camphor tree. The tree has active components of camphor found in every part of the tree. The tree is native to Formosa or Taiwan, China and Japan. The white camphor oil extracted from the tree, can be used in vapor therapy to clear the lungs, dispel apathy and calm nervous depression. It has a beneficial effect on any psychosomatic illness, while having good effect on painful muscles when used with great care. The oil was a well-known remedy against the plague and embalming corpses in the old Persia, now Iran, while the Chinese used the tree to build ships and temples, because of the durable and aromatic properties of the wood. In my grandfathers house in the town centre of Tromsø there was a beautiful Chinese camphor chest decorated with carvings of dragons, ships, people and animals. I cannot really tell, but maybe the smell of white camphor combined with the images of the carvings on the camphor chest had the positive effect of making me feel better from my cold. White camphor oil can be bought in your local drugstore. The Costal Express or Hurtigruten is considered as one of the world’s most beautiful sea voyages. 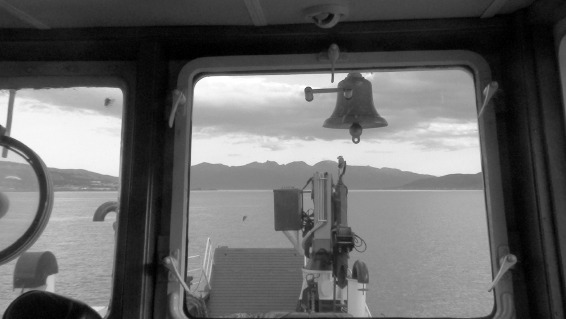 For more than 115 years Hurtigruten has been the most important communication link between the north and south of Norway. Translating as ”fast route”, it was the quickest and most reliable passage into the remote lands of northern Norway, regardless of weather conditions. In the 1950-60, this piece of wool was a part of a blanket which belonged to the cabin equipment on the Costal Express Nordstjernen or The North Star. Today the woolen blankets are replaced with more modern cabin equipment and the company has extended their cruice programme to include Greenland and Antarctica. In 2005 I had the opportunity to travel with Nordstjernen from Lonyearbyen, Spitzbergen to Hindlopenstredet which is located at 80 degrees north. Spitsbergen and the other islands in the Svalbard archipelago are located in the Arctic Ocean, halfway between Norway and the North Pole where the warmer currents of the Gulf Stream meet the cold air and water from the north. Every summer, thousand of seabirds migrate to the coastal cliffs of Svalbard due to its proximity to the feeding grounds. The field landings from Nordstjernen took us both close to the Arctic wildlife,including the polar bear, and to the ghost hunting stations from past times, when farmers from northern Norway headed for Svalbard to seek their fortunes as trappers. I still cannot tell, but I could imagine, the trappers from the northern Norway in their hunting huts at Spitzbergen,using white camphor oil from China on a piece of wool, curing their cold.